[San Francisco, CA - April 21, 2017] A business division of DiCon Lighting, Fiilex proudly announces the new P360 Pro and P360 Pro Plus portable LED lights to the broadcasting market. These cutting-edge lights bring many innovative features and performance enhancements to the award-winning P360 product family. They are first in a line of new products Fiilex will release at NAB 2017. The most noticeable change for Fiilex's P360 Pro and P360 Pro Plus is the gorgeous OLED display. It shows the precise CCT, hue (for Pro Plus), intensity, and DMX readouts to easily match or recall settings. In addition to the distinct screen, Fiilex also made some ergonomic improvements, including a new accessory lock, a longer yoke, and a deeper spigot. Underneath the familiar black with red pinstriped shell is where Fiilex truly shines with its engineering capabilities. At the core, a new generation of Dense Matrix LED achieves 2800K-6500K tuning range, >95 CRI/TLCI, and 10% brighter light output. A new and more efficient board is designed to hold the OLED screen and mount 2 multi-functional knobs. To complement the hardware, a new Firmware delivers smoother color tuning, reaches lower dimming limit to 0%, and provides hue adjustments (for Pro Plus). These innovations enable professional users to work easier, faster, and have better control of the light. 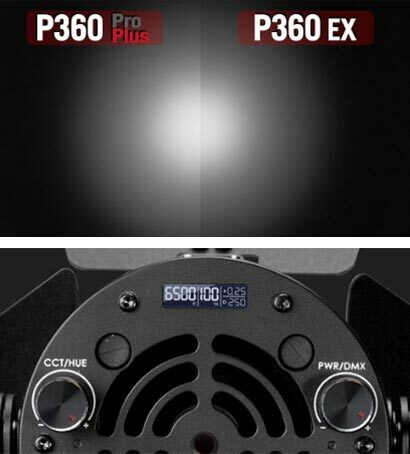 "Fiilex first introduced the original P360 at NAB 2013. The great light quality, the color tunability, and the compact size of the P360 instantly made it the gold standard in portable lighting for on-location filming by professional broadcasters", says Brian Chiang, Vice President of Marketing for DiCon Lighting. "We are raising this standard again with the P360 Pro Plus and its hue control, which we designed based on user feedback." Fiilex will showcase the new P360 Pro and P360 Pro Plus at the upcoming NAB Show in Las Vegas on April 22-27, 2017 (Booth #C10735). The MSRPs in US are $845 and $995 respectively. Both products will be available in the market on or before June 1, 2017. Fiilex is a brand and business division under DiCon Lighting, a 30+ year old San Francisco Bay Area based photonics technology company with world-class design, engineering, and manufacturing capabilities. Since our debut in 2013, Fiilex has released a long list of LED products based on DiCon's Dense Matrix LED platform. We consistently deliver high quality, tunable, shapeable, portable, powerful lights. With industry leading LED technology, superior product performance, and revolutionary industrial design, Fiilex continues to receive rave reviews and prestigious product awards.